Vestil Self-Propelled Battery Powered Platform Trucks Help Reduce Worker' Compensation and Insurance Claims! 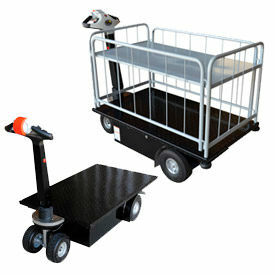 Vestil Self-Propelled Battery Powered Platform Trucks help promote worker safety at the office or warehouse. Integral traction drive features a 500W, 24V electric drive motor, (2) 95AH batteries, and an on-board 6 amp battery charger. Ergonomically designed low-hinged handle with pivot-action offers variable speed control, horn, and safety-reverse features. Unit operates up to 2.8 mph when unloaded, and up to 2.5 mph when fully loaded. Standard features include automatic braking, automatic parking brake, free-wheel lever for manual operation, and battery gauge level. Electronics are enclosed in splash-proof casing for safety. Rolls smoothly on two 9" solid foam steer wheels and two 10-¼" solid foam load wheels. 14" deck height and non-slip tread-plate surface. 1 Year Limited Warranty. Vestil Mid-Axle Drive Motorized Electric Platform Cart features a Mid-axle Drive that allows Deck Truck to Turn on its own Radius. Vestil Mid-Axle Drive Motorized Electric Platform Truck moves material faster, helps increase productivity and improves employee safety. Turns on a dime, as mid-axle drive allows this Battery-powered Platform Truck to turn on its own radius. Electric Platform Truck is powered by (2) 45 amp batteries that offer 20 mile range on a full charge and a 5 amp on-board battery charger. Heavy duty 800 watt motor operates at 4.8 MPH on an even surface. Powered Platform Truck measures 68-3/4"L x 28-3/4"W overall; 60"L x 28"W deck with a 12" deck height. Control panel includes variable speed dial, fingertip forward and reverse lever, battery level gauge, horn and emergency reverse switch. 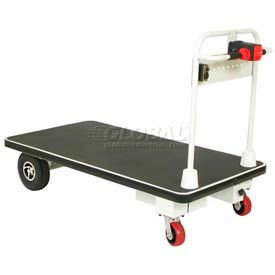 Platform Truck features a 42"H handle, 9" diameter foam filled drive tires and 4 swivel casters for easy mobility. Shipped assembled. Electro Kinetic Technologies Motorized Platform and Shelving Carts provide Powered Transportation for Large, Bulky Items in Material Handling, Warehouse, Industrial Environments and more. Electro Kinetic Technologies Motorized Platform and Shelving Carts are made of welded tubular steel and chrome plated steel for long lasting durability. 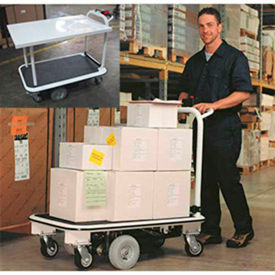 Motorized Platform Carts eliminate employee injuries due to excessive pushing and pulling. Deep-cycle AGM rechargeable batteries and never-flat drive tires provide minimal maintenance. Solid-state regenerative braking and holding brake maintains position on inclines and provides additional employee safety and security. Full wrap around vinyl bumpers provide protection to cart and surrounds. Ergonomic handle control provides variable speeds. Keyed power on/off switch can be removed for security. 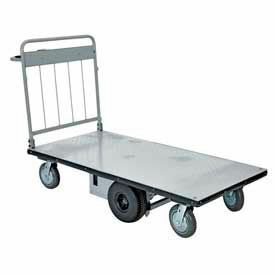 Types are Motorized Linen Cart with Vinyl Cover, Motorized Platform Cart, Motorized Platform Cart with Shelving, and Motorized Shelving Stock Cart. Weight capacities are 1500 lbs., 2000 lbs., 3000 lbs. and 4000 lbs. Dimensions vary per Model. Wesco® Electric Powered Platform Trucks do All of the Hard Work for You! Wesco® Self-Propelled Battery Powered Platform Trucks handle all sorts of loads in retail stores, warehouses and offices. Powered-drive Deck Truck features a powerful 370W drive motor with a Curtis 110 amp controller that allows the unit to operate at 2.4 mph when unloaded, 1.9 mph when fully loaded, and offers a maximum climbing incline of 8°. Fingertip variable speed controller features simple forward/reverse operation and unit stops automatically when trigger is released. Automatic beeper alarms operator when in reverse for safety. Two 12V 40 AH batteries offer 6 hours of continuous use and integral charger allows full recharge in 7-8 hours. Non-skid vinyl deck surface helps retain cargo. Emergency stop, keyed lock, illuminated battery status indicator and full perimeter deck bumper guard are standard. Rolls smoothly on two 5" rubber steer wheels and two 10" pneumatic load wheels. Wesco® Self-Propelled Battery Powered Platform Truck 272416 30x60 1100 Lb.